There's an endless number of techniques to boost your brainpower, from learning a new language to exercising to drinking lots of beer (two of those are true). But without enough of the right fuel, your brain won’t advance, or even maintain its current level of function. 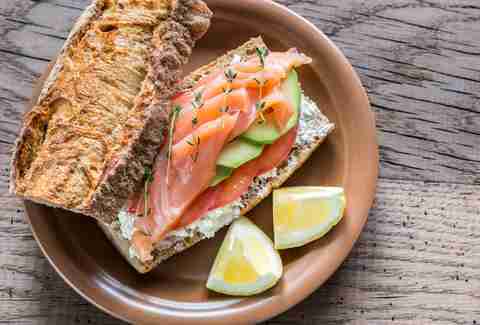 "The brain has high demands for B vitamins, omega-3 fats, and minerals like potassium due to its very high metabolic rate," says Dr. Drew Ramsey, assistant professor of clinical psychiatry at Columbia University and the author of Eat Complete. "After all, making consciousness takes a lot of energy." While these vitamins and nutrients aren’t difficult to obtain with a nutritious diet, an alarming number of people fail to do so. According to Dr. Ramsey, dietary insufficiency of key vitamins and minerals may affect up to 90% of people. Don't be one of them; start eating these foods that will give your brain the high-octane fuel it needs to stay sharp. Why Do We Biologically Crave Food That Will Kill Us? Omega-3 fatty acids are all the rage among health food lovers. But unlike other claims you’ll find in the supermarket aisles, this is one you should actually pay attention to. "Fatty fish and bivalves are the top sources of the long-chained omega-3 fats," says Dr. Ramsey. A deficiency of this critical fat can result in major mental problems like fatigue, memory loss, mood swings, and depression. Dr. Ramsey recommends getting your omega-3s through two weekly servings of mussels, oysters, or salmon. And unless you shun seafood altogether, opt to get your omega-3s through food, not supplements, especially if you're an older adult. You really should eat pumpkin seeds more often than on Halloween. In Dr. Ramsey's case, they're a part of his practice. "I prescribe a lot of pumpkin seeds, as they are full of tryptophan, magnesium, fiber, and zinc," important minerals for brain function. Just don't go overboard with additional zinc supplements, since too much zinc can be just as bad as too little. Adult women should strive to get 8mg of zinc daily, while men should shoot for 11mg. Around 85 whole roasted, unsalted pumpkin seeds (or one ounce) packs nearly 3mg of zinc. 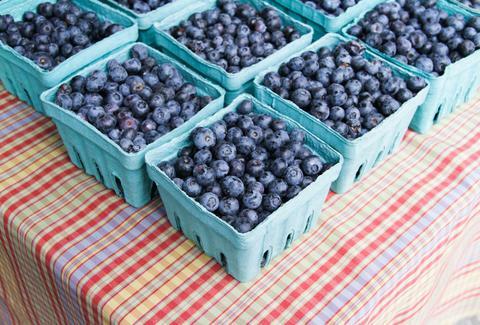 Antioxidant-rich blueberries are a no-brainer for brain health. Fruits high in antioxidants can prevent and reverse neurochemical changes from aging, and a chemical found in blueberries may enhance memory. Even if blueberries aren’t in season, you can reap these cognitive benefits year-round through frozen blueberries or juice. Pop ‘em in a smoothie, on yogurt, or even in ice cream for some guilt-free brain fuel. Jerusalem artichokes, or sunchokes, are a brain food favorite of Dr. David Perlmutter, author of Brain Maker. Jerusalem artichokes are part of a group of foods known as prebiotics, which promote healthy bacteria in the gut, reducing negative feelings associated with anxiety. 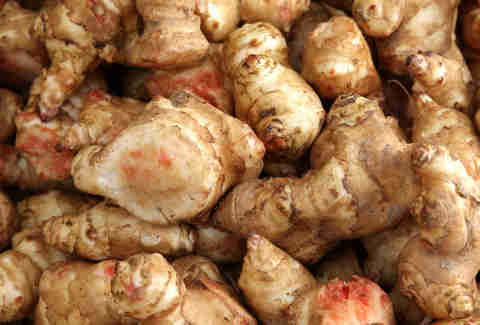 As for how to eat Jerusalem artichokes, Dr. Perlmutter recommends tossing them in salads. Tempeh Vegetarians have long used tempeh (fermented soybeans) as a meat substitute, but it’s also a powerful brain food, according to Dr. Perlmutter. Tempeh is a good source of probiotics, which help you maintain a healthy gut microbiome, which is linked to a reduction in anxiety and depression. It may look strange, but tempeh’s earthy, slightly sour flavor and chewy texture are downright addictive when prepared properly. Walnuts Is it a coincidence that walnuts have the same shape as the human brain? Yes. But it's a resemblance that works, considering the nut’s brain-boosting properties, high omega-3 content, and ability to keep you alive longer. Walnuts also contain vitamin E, a deficiency of which could actually damage the brain. Not in the mood for walnuts? Reach for almonds, hazelnuts, or peanuts for similar benefits. 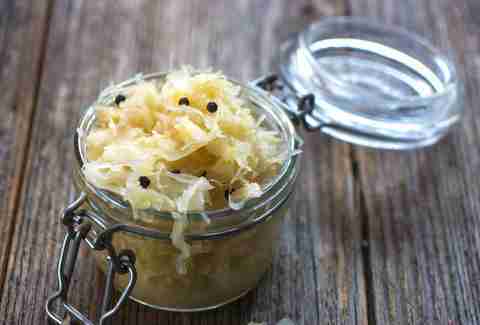 German for "sour cabbage," sauerkraut is a probiotic food that keeps guts and brains healthy. Dr. Perlmutter recommends it because it contain choline, an essential nutrient "needed for the proper transmission of nerve impulses in the brain and throughout the central nervous system." As a fermented food, sauerkraut has also been linked to decreased social anxiety in young adults. Grab some friends and head to your closest German doner stand. If you happen upon a nice lager while you're there, that's your choice. In general, healthy diets should consist of vegetables in every color of the rainbow (kale, swiss chard, squash, peppers, etc.). "The different colors represent different pigment molecules, which work in the body to reduce inflammation, improve your detox abilities, and even trigger brain growth," notes Dr. Ramsey, who encourages patients at his psychiatry practice to "eat the rainbow." The molecules work together, and individually, to create an overall sharper, smarter you. Joni Sweet is a writer who’s swapping her B12 supplements for BBQ tempeh. Follow her on Twitter and Instagram at @JoniSweet.